Back in the nineties, when I was teaching college freshmen composition classes, I had a student who was by far the worst speller I ever encountered. In that first assignment, I directed my students to write about something they knew a lot about. This student’s topic was the grooming of horses. Spell-checking software had been incorporated into virtually all personal computers by then, but spell-checking programs don’t catch everything, and misspellings were everywhere. In a cringe-worthy moment unique in my decade of teaching college writing, one of my female students wrote about grooming horses. At one point in her essay, she intended to use the phrase “gently stroking,” in connection with her horse. Instead the spell-checker offered several choices, and the adverb that she selected was “genitally” stroking. Two decades later, I find my own spelling skills weakening. Certain words, particular those derived from French, such as denouement, strike me as especially challenging. This comes as no great surprise. After all, my short-term memory has been declining for almost five years. My most recent neuropsychological exam indicated that I was in the lowest 1 percentile in short-term memory. Why did I walk into this room? Oh, yes, I was looking for my cellphone. Google can be helpful in landing me in the right lexicon neighborhood. But spelling remains challenging, and is likely to get worse. But does skill at spelling, which is dependent on short-term memory, really matter in the age of Google? Yes, it does. My former student demonstrated that. My deteriorating short-term memory is an example of why Alzheimer’s is such a maddening disease. Everything rolls downhill. 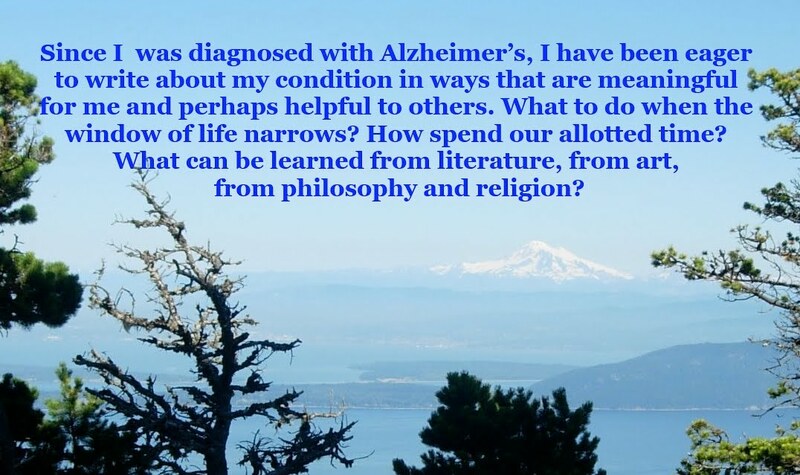 This week’s post has little to do with Alzheimer’s, other than the act of writing and reading on a daily basis is a means of keeping my mind sharp. In a typical evening at home, I will read for one or two hours. Over the past month I’ve been engrossed in Jean Edward Smith’s 766-page biography of Dwight D. Eisenhower. Why Ike? After all, the fifties are often remembered as an age of stultifying conformity, shoehorned between the heroic war years and the upheavals of the sixties. Long before Eisenhower was elected president, in 1952, he had far-reaching international experience, having been stationed in Paris, the Panama Canal zone, and the Philippines–this all long before World II broke out. And he was the architect, of course, of the largest amphibious landing in the history of war. Unlike two other famous World War II generals—George Patton and Douglas MacArthur—Ike had a healthy ego, not an oversized one. Smith describes Eisenhower as a “progressive conservative.” Is this a contradiction in terms? Another way to put it is to say that the changes Eisenhower brought about came at a slower pace than under FDR or Lyndon Johnson. After the war—and the emergence of the Cold War—Eisenhower was the principal architect of NATO. Ike was no hawk. He was not involved in the decision to drop the atomic bombs on Hiroshima and Nagasaki—Harry Truman was the president then—but later he commented, “it wasn’t necessary to hit them with that awful thing.” MacArthur, on the other hand, appears to have favored using atomic weapons during the Korean War. By the time Eisenhower came into office, the Democrats had occupied the White House for twenty years. Unlike in our more polarized era, in the 1950s both parties had liberal and conservative wings. In 1952, when Eisenhower was serving as the president of Columbia University, both the Democrats and Republicans sought him to be their nominee. He chose the GOP. But there is no question that many of his views and policies had a liberal or internationalist slant. He defended General George Marshall, the architect of “The Marshall Plan,” the infusion of $12 billion (more than $120 billion in today’s economy) to stabilize Western Europe in the aftermath of World War II. Rarely before or since has public money been so effectively deployed. To the extent that there were problems on the way to the presidency, they were provided by Richard Nixon, Ike’s running mate. Nixon, then a fierce anti-communist, was on the ticket to placate the party’s right wing. Ike was never fully comfortable with Nixon as his running mate, and when Nixon became involved in a campaign-funding scandal, Eisenhower was intending to drop him. But Eisenhower, in a rare episode of poor judgement, permitted Nixon to address the nation, and Nixon’s maudlin “Checkers” speech—“Checkers” was Nixon’s young daughter’s dog—turned out to be a national sensation. Thousands of telegrams arrived overnight, almost all of them urging Eisenhower to keep Nixon on board. Just months after Ike’s defeat of Democrat Adlai Stevenson, Eisenhower, fulfilling a campaign pledge, traveled to the Korean Peninsula. The president’s son, John Eisenhower, was stationed at the front, serving as a major. This appears not to have been a token gesture. Certainly Ike could have arranged for his son to have a less risky role, one far from the actual fighting. But this, I think, points out an essential fact about Eisenhower—his conviction that all Americans should be treated in the same way. Much later in his presidency, Eisenhower directed federal troops to enforce a court directive to desegregate the schools in Birmingham, Alabama. The decision, Brown v. Board of Education, had profound implications. Until then, legal doctrine held that “separate but equal” accommodations, in housing, in public transportation, and in schools, was permissible. A president with other priorities might have ignored the implications of Brown v. Board and left it for his successor. A few years earlier, in 1956, the Eisenhower administration faced separate geopolitical crises months apart. In Europe, the Soviet Union sent troops into Hungary to quash a popular uprising, instantly raising the temperature of the Cold War. A couple of months later, the Eisenhower administration had to walk a diplomatic high wire between nominal allies France, Britain and Israel on one side and the United States on the other, concerning the fate of the Suez Canal, the lifeblood of Middle Eastern commerce, oil in particular. Most surprising to me is that it was Eisenhower, not some think-tank guru, who coined the term “military-industrial complex”—Eisenhower’s understanding that the relationship between defense contractors and government officials had become much too cozy, to the detriment of democracy. In his farewell speech, 56 years ago this week, Eisenhower commented, “In the councils of government, we must guard against the acquisition of unwarranted influence, whether sought or unsought, by the military industrial complex. The potential for the disastrous rise of misplaced power exists and will exists. Eisenhower, in other words, was pretty much the complete package—a president who was a champion of civil rights, who didn’t regard defense spending as a sacred cow, who didn’t overeact to international crises, who rarely lost his cool. Was he the most accomplished president of the twentieth century? No, that would be FDR. But Eisenhower was the right president at the right time. And what can we say about the man who will become our president today? Does he have any of the attributes that informed the Eisenhower administration? Ike’s lack of pomposity? His willingness to treat his own son as just another soldier? His level-headed decision-making? His fair-mindedness? His empathy? Soon after the new year, I came across an Associated Press article provocatively titled, “Study suggests strict rest may not be answer for concussions.” The AP piece was written by Lindsey Tanner, who specializes in medical issues. But the topic apparently originated at the Toronto-based Canadian Sports Concussion Project. According to Tanner, roughly a month after their concussions “ongoing or worse symptoms were more likely in children and teens who were inactive during that week” [my italics]. “Activity” was defined as “light exercise,” such as walking and swimming. The benefit, according to researchers, is both physical and psychological. Aerobic exercise, even at a mild level, refreshes blood to the brain. And that leads to a feeling of well-being, akin to mild runner’s high. In Ohio, the birthplace of the National Football League, policymakers appear to be taking seriously the task of making youth football safer. “The whole point is the medical needs of the student- athletes are being addressed,” said Dr. Leda Ghannad, who specializes in sports injuries involving children and adolescents. I wish I had a doctor, or an enlightened coach, like her when I was a teenager. In the spring of 2013, Ohio introduced its “Return to Play” youth concussion law. The law makes clear that any student-athlete must be removed from that game or practice, and, if a concussion is supected, the athlete will not be eligible for a game or practice until he or she has received the OK from a doctor. And coaches and referees must undergo training for spotting concussions’ warning signs. This is a long way from my experience as a high school football player in the late 1970s. Coaches routinely advised players to “shake it off” after they got their “bell rung.” Head-to-head contact, especially for linemen, was routine in practice. That’s not to say that nothing changed during the years I played the sport. Near the start of my sophomore season, in 1978, the rules for tackling changed almost overnight. Darryl Stingley, a wide receiver for the New England Patriots, was paralyzed by a savage hit by Jack Tatum, the Oakland Raiders’ head-hunting defensive back. No longer did our coaches tolerate the practice of leading with our heads when we made tackles. For defensive backs, like me, we were no longer allowed to hit head-to-head when we came rushing up from the secondary to make a tackle. This change didn’t just protect receivers. It also changed the rules for making a proper tackle—head to the side, rather than head-to-head. Before long, rule changes at all levels of the sport prohibited “spearing”—the use of one’s helmet as a guided weapon, rather than as a protective device. Football will always be a violent sport, and many parents will advise their children not to participate in it. That said, within the last few years, the frequency of concussions that are diagnosed is probably higher than ever. It’s the undetected brain injuries that are most threatening to young athletes’ future health. Do Republicans really want to leave in the lurch millions of Americans—Republicans, Democrats, independents, not to mention the vast number of Americans who don’t vote—with health care they cannot afford? Many of us are relatively lucky; we live in Massachusetts. From 2003 through 2006, Mitt Romney was our governor, and it was clear early on that Mitt had higher ambitions. To achieve his lofty goal of health care reform, he touted what became known as RomneyCare. But Romney’s signature accomplishment was not particularly appreciated beyond Massachusetts. In the 2008 primaries, he was defeated decisively by John McCain, the Vietnam war hero who, in the run-up to the GOP convention last summer, was attacked by Donald Trump. In case you have forgotten, Trump’s apparent line of reasoning: was: Real heroes don’t get captured. But I digress. Thursday’s Boston Globe reported that President Obama, who leaves office in just two weeks, made the argument that Republicans would pay a stiff political toll for abandoning a health care system that, though imperfect, is essentially working as it was supposed to work. And to people without an ax to grind, it should be clear that the benefits of Obamacare far exceed its drawbacks. More Americans are insured than ever before; people with pre-existing conditions can buy insurance, and buy it at the same rates as those who don’t have pre-existing conditions; women can’t be charged more than men for insurance; and adult children can stay on their parents’ insurance plans until age 26, a very popular feature. For our family, Obamacare has provided a way to obtain insurance after we lost our coverage when my medical leave from work ended. It hasn’t been perfect, but it has been much less expensive than buying insurance through COBRA insurance would have been. And we did get to keep all of our doctors, thanks to the plan we chose. Plus, thanks to the Obama administration, all pre-existing conditions are being covered. Republicans often tout tax-free Health Savings Accounts (HSAs) as an alternative to Obamacare, but one has to be financially well off to benefit from them. If your family income is well over $100,000, maybe HSAs will work for you and your family. But that’s not the case for most of us. As the Globe noted, “Republicans have passed dozens upon dozens of symbolic measures” to repeal Obamacare, and Trump has made clear that he wants the law repealed. But then what comes in its place? Will we have to pay for major medical coverage and then get hit by large deductibles and unreasonable co-pays? The last time I visited my neuropsychologist, the bill—if I didn’t have health insurance (thanks to Obamacare)—would have been around $3,000. And this was a decidedly low-tech medical procedure, basically a few hours devoted to assorted quizzes and other relatively simple cognitive testing. As Obama has made clear, the politics of health care favor the Democrats. It’s one thing to rant about Obamacare, as Trump has done repeatedly; it’s quite a different thing to face the resulting rage once constituents learn that they are losing their insurance and the alternative is way too expensive. It’s the kind of issue that could go a long way toward ensuring that Trump is a one-term president, once his erratic ways are made clear to a decisive majority of American voters. And it’s worth keeping in mind that Trump lost the popular vote by almost 2.9 million votes. That’s not some statistical oddity: Clinton was by far the more popular candidate. So, House Speaker Paul Ryan is incorrect when he says the election results mean the American people want to end Obamacare. In fact, a November poll by the Kaiser Family Foundation found that only 26 percent of Americans supported repealing Obamacare, according to the Washington Post. And when these 26 percent were told that repealing would mean the end of coverage for pre-existing coverage, 38 percent of them changed their mind. And more (19 percent) of those still in favor of repeal changed their mind when told that over 20 million people would lose their insurance. These are figures that Republicans intent on repealing Obamacare should keep in mind.